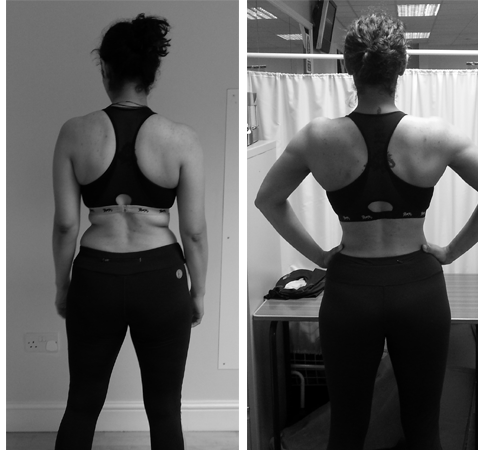 Heema came to me for Personal Training at the private Epsom studio with goals of toning up, looking better and feeling energised. This is a perfect example of a situation where weight loss alone does not tell the whole story. As you can see from the following pictures, Heema’s transformation is not told by numbers alone. Most prominent is the back shot where most of her body fat and weight loss occurred. As you can see she has succeeded in her goals! The Personal Training sessions were one hour in duration and took place twice per week. No other training took place on her off days. We focused primarily on strength training and Kickboxing with a smattering of “cardio”. The diet was kept very simple with a calorie limit and a protein intake target. Simple wins the day as does long term compliance. I begun my personal training when I was at my lowest ebb. Over-indulging, self-pity and channel-surfing were my daily tasks! I had always been relatively fit and healthy, ate well-balanced meals and maintained a healthy body type. I escaped from ‘prison,’ broke free and ‘Colonel Sanders’ became my best friend hence the grotesque triple back fat roll ‘before’ picture! He observed my strengths, weaknesses and pleasure elements (going home time!). Strengths being boxing, deadlifts and more boxing! Weaknesses being cardio and a penchant to moan at every opportunity! So he capitalised on what I enjoyed, ensured he captured elements into our sessions to keep each one varied and exciting! The hour sessions flew by, especially when I was busy punching the s*** out of the punching pad, which resulted in sore shoulders; Williams’, not mine! Hams fitness has been life changing. The most positive and life-altering experience I have ever had! Williams always ensured I understood what and why I was doing an exercise so that I had the knowledge to venture out and experiment by myself! A true motivational leader that knows his stuff! Kudos for recognising which body parts I needed to target, and double kudos for managing to motivate me. Need help ?. After losing three stones 2 years ago, I have slowly put it back on. I find it very difficult to motivate myself to get to the gym despite quite enjoying it when I get there. I have a bad lower back and damaged shoulder but really need to change my weight and fitness to feel better again. I’ve got terrible, terrible posture, which I would love to improve. Well done on losing the weight two years ago. I am sure you can get back to a healthier weight with dedication and self control. Pick a workout routing that you can adhere to consistently and don’t beat yourself up too much if you have a bad meal every now and again. Stay away from extremes in diet and exercise, middle ground and slow and steady. Drop me a line from a contact page if you want any further help.